Kitty has been with us for quite a while now. 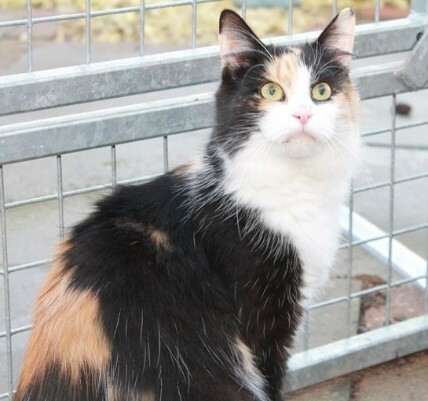 Initially Kitty arrived with aggression issues having been dumped on our doorstep by her owner and we quickly found out she was hard to handle she didn’t like brushing or being stroked for longer than a few seconds without getting your hand scratched. Kitty was put on our rehab program, taking everything at her own pace and we saw a new Kitty about 8 – 10 months after we had her. She enjoys sitting on your lap, has the loudest purr and loves one to one attention. She likes men as well as women but I think she could quite easily become a daddy’s girl. We let Kitty initiate contact and she knows how to get our attention by getting to the front of the que when her carers go in to feed and clean. Kitty is the most beautiful girl but for some reason, maybe because she doesn’t come forward to greet new people has been constantly overlooked. She would ideally love a home away from busy roads without any other animals or children and a garden to play in as she is quite mentally and physically active.